What would the charges be if he were a non white Muslim? White, anti-Democrat, 2nd Amendment enthusiast, former military, male. Such a devout, real American patriot could not possibly be a terrorist. Further sign of DOJ decline? I don't get it otherwise. So when he goes out and buys another gun and shoots Rep. Omar, the right wing cheering will be interspersed with, "Who could have foreseen this tragic event?" These folks will submit to justice.....provide that the people (of any color) who still are not paying attention choose to participate in their own government. It's dull and fuddy duddy, but it creates situations that can benefit people. All people. And liberals planning on attacking conseratives. Hasson is actually a crisis actor staging a one man play. He will be charged as a Super Mega Patriot, and will be sentenced to a weekly gig on Fox News for only $250k a year. Well, crap! That's my whole day's dose of enraging news in one story. It goes against the narrative that there are no white nationalist terrorists. Hey, c'mon, he was just kidding around. Can't anybody take a joke? None. He would be dead already. Cops feared for their life. One can only hope that NOT charging him with domestic terrorism will not result to opinions of “an otherwise blameless life” or “very fine people on both sides”! Terrorism of any kind...international, domestic, stochastic...should never be a partisan issue because it endangers people’s lives! Silly TPM. 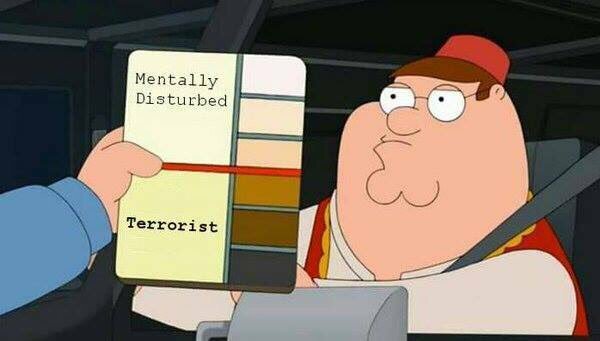 White people aren't terrorists. Only brown people are terrorists.